Transit users and commuters across Ontario can look forward to transportation improvements as part of the Government of Ontario’s historic new transportation vision, Premier Doug Ford announced today. Joined by Jeff Yurek, Minister of Transportation, and Monte McNaughton, Minister of Infrastructure, Ford announced a $28.5 billion expansion to Ontario’s transit network. According to Ford, this is the most money ever invested to get shovels in the ground and get new subways built. Premier Doug Ford says the province has been in discussions with the three other governments about funding for the project, but says if need be, Ontario will shoulder the whole burden. He says that while the province hopes the federal government, the City of Toronto and York Region will chip in more than half of a $28.5-billion transit project, Ontario is willing to foot the whole bill. The Progressive Conservative government says the new 15-kilometre relief line will run from Ontario Place in the city’s west to the Ontario Science Centre in the east. The city’s current plan for the relief line runs 7.5 kilometres from the subway line on Danforth Avenue to the line on University Avenue in Toronto’s core. The province says it can deliver the project by 2027 _ two years earlier than the city’s projections – using stand-alone technology and a different procurement method. The project will cost $10.9 billion, up from the city’s $7.2 billion estimate for its version of the line. According to the Ford, this funding is in addition to the significant contributions made to transportation in Ontario. In just nine months, Ontario has delivered the long asked for expansion of GO Train service to Niagara Falls and St. Catharines, years ahead of schedule; dramatically enhanced GO Train service to Kitchener-Waterloo region; committed billions to transit projects for Hamilton and Ottawa regions; moved ahead with the long-awaited light rail transit for Mississauga; and announced $1.3 billion to repair and rebuild highways across the province, as well as billions in infrastructure to better support our rural communities. Toronto Mayor John Tory was not at the announcement because he hadn’t been fully informed about it, he said a day earlier. Ford has promised to upload responsibility for Toronto’s subway system, including all future projects, to the province. The Toronto Transit Commission would retain control of the day-to-day operations of the subway, buses, and street cars, and the city would keep fare box revenue. Vaughan and York Regions voice is heard! Commuters in Vaughan, York Region and the GTA can look forward to greater access to transit. Today the provincial government announced a new transit plan that includes the Yonge North Subway extension. – The Ontario Line will cost $10.9 billion and will be delivered by 2027. 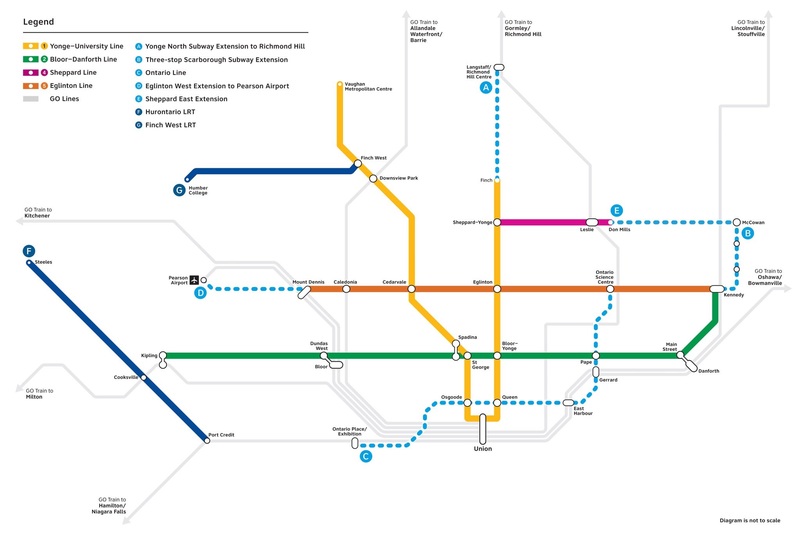 – The Yonge North Subway Extension will cost $5.6 billion and should be open soon after the Ontario Line. – The Scarborough Subway Extension will cost $5.5 billion and will be delivered before 2030. – The Eglinton Crosstown West Extension will cost $4.7 billion and will be delivered before 2031. – The projects will require a combined $28.5 billion, of which the province has committed $11.2 billion.